GREAT ORMOND STREET Hospital is applying for a new court hearing on the Charlie Gard case “in light of claims relating to potential treatment”. It emerged yesterday that a New York hospital had offered to treat Charlie Gard – a baby with a rare genetic disorder who is due to be taken off life support after courts ruled further treatment would prolong his suffering. 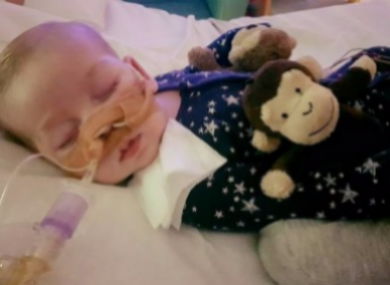 The parents of Charlie Gard, who is 10 months old and has brain damage, had been fighting to take him to the United States for an experimental treatment for his extremely rare form of mitochondrial disease. However they lost their case in British courts and the European Court of Human Rights. Great Ormond Street Hospital in London have been treating Charlie. The New York Times reported that the New York Presbyterian Hospital and Columbia University Medical Center would treat Charlie with an experimental drug pending approval from the Food and Drug Administration (FDA), a government regulator. [The hospital] agreed to admit and evaluate Charlie, provided that arrangements are made to safely transfer him to our facility, legal hurdles are cleared, and we receive emergency approval from the FDA for an experimental treatment as appropriate. The offer is the latest intervention in Charlie’s case, after statements were made about the case by US President Donald Trump and Pope Francis this week. “If we can help little #CharlieGard, as per our friends in the UK and the Pope, we would be delighted to do so,” Trump said in a tweet. Researchers at Columbia University previously provided an experimental treatment to a child in Baltimore, Art Esopinan Jr, suffering from a similar form of the syndrome. The treatment used, called nucleoside therapy, is not approved by the FDA, but can be requested for compassionate use. The boy’s father, Art Esopinan, told the New York Times that the treatment is making his son steadily stronger. “My wife and I believe that little Charlie Gard should be given a chance because we believe there is hope,” he said. The case has tugged at heart strings in Britain, where more than £1.3 million (around €1.5 million) has been raised through GoFundMe to pay for the experimental treatment. A hundred protesters held a demonstration outside the gates of Buckingham Palace in London on Sunday, shouting “Save Charlie Gard” next to a banner that read ‘Murder’. The courts had ruled that keeping the baby on life support would only prolong his suffering as there was no hope of his recovering from the disease which causes progressive muscle weakness, including in key organs such as the heart. Email “Great Ormond Street Hospital applies for new hearing into baby Charlie Gard's case ”. Feedback on “Great Ormond Street Hospital applies for new hearing into baby Charlie Gard's case ”.